You can spawn a blob into an adjacent space or you can jump into an open space one square away. Select a blob on your team by clicking it with the mouse. 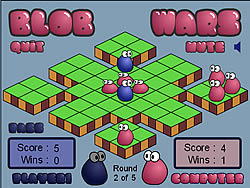 Once selected your blob will be highlighted and the possible moves you may take will be shown with darkened green tiles. Click on a highlighted space to complete your move.